To provide a clear academic pathway for students desiring a veterinary career in food animal agriculture. 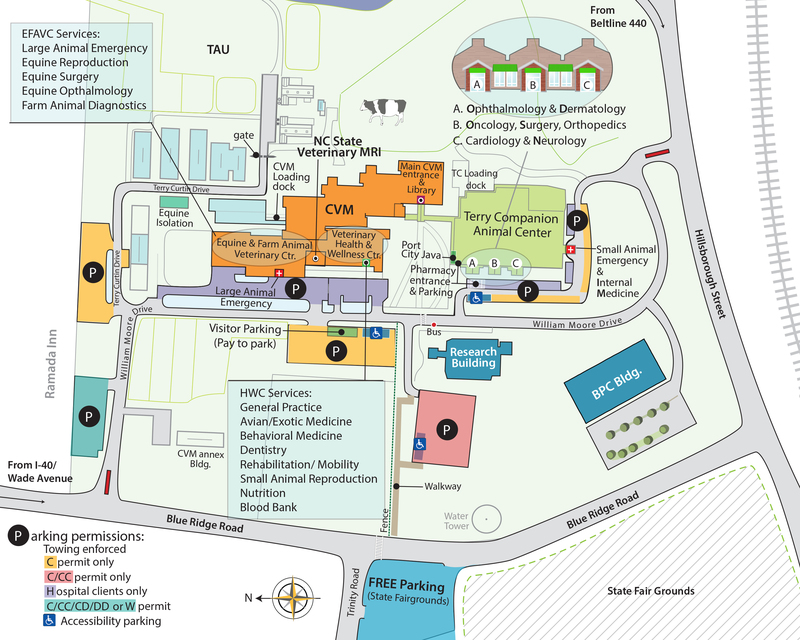 To provide admission to the N.C. State University College of Veterinary Medicine (CVM) for up to six Food Animal Scholars each year, provided they meet minimum standards for acceptance established by the Admissions Committee. To devise a plan of academic work, experience, and mentoring for Food Animal Scholars which encompasses undergraduate and veterinary medical education and meets specific needs of animal agriculture. To provide a continuous supply of new veterinary graduates with skills, experience and expertise with Food Animal Species comparable to a DVM with one year of clinical experience. These new graduates will immediately be able to provide valuable service to modern animal agriculture and will be mentally prepared to continually grow and improve as scientific health professionals. To continually promote and increase the visibility of the Food Animal Scholars and the Food Animal Scholars Program. The Fisheries and Aquaculture Scholar Program seeks to identify bright undergraduates in the Fisheries major at NC State who are interested in a career in fish health. Though aquatic medicine is becoming a more popular career path, the vast majority of students are interested in either major display aquarium work or careers that include treatment of aquatic pets. There is a serious dearth of veterinarians who are interested in the important food production aspect of aquatic health (fisheries and aquaculture). Student who enter the program are mentored to combine their fisheries major requirements and the veterinary DVM pre-requisite courses. They are evaluated on their academic performance and their dedication to food production aquatics, and are selected by the NC State fisheries faculty in consultation with CVM aquatics faculty. Up to two students could be selected per year for automatic admission dependent on successful completion of admissions requirements each year. However, the pool of potential students is such that to date at most one student has been chosen to pursue a career in aquatic health. The Laboratory Animal Scholar Program was one of the very earliest scholar programs created. It is a partnership with NC A&T that has provided excellent students focused on careers in laboratory animal medicine for many years. Students are selected to participate by NC A&T faculty and are extensively mentored through their undergraduate work in some collaboration with NC State CVM faculty. Top students are selected for up to 2 positions in the upcoming class each year, dependent on their successful completion of all requirements for admissions. This program has provided outstanding opportunities to place diverse students into our DVM classes. The Ecosystems Health Scholar Program (under consideration) is patterned after the very successful Laboratory Animal Scholar Program that recruits top students from NC A&T who are interested in fisheries, wildlife or conservation health careers. It is currently in the process of establishment and is intended to provide an important diversity to the future veterinarians working in the veterinary disciplines relevant to ecosystems health. The program involves mentoring and selection of students participating by NC A& T faculty and then in their third year selection of the top performing students in consultation with appropriate CVM faculty for up to 2 positions in the next veterinary class. The NC State-CVM recognizes that the pathway to a degree in veterinary medicine can be more challenging for individuals from a rural background, but that these individuals represent a desirable demographic which can add much needed diversity to the profession. Therefore, NC State-CVM has established a UNC-SVEA Program with UNC campuses which are not located in central urban areas by which mutually agreed upon UNC-SVEA Program participants, meeting all criteria of their home institution and the NC State-CVM admissions criteria, may gain admittance to the NC State-CVM veterinary program. This agreement will be established first between NC State-CVM and UNC Pembroke School of Biological Science with the potential goal of expanding the program to other rural UNC campuses. Up to two (2) students plus one (1) alternate from each entering first-year class of UNC Pembroke’s Biology program may be selected to enter the UNC-SVEA Program. Students must be enrolled in a bachelor’s degree program in the Biology Department. Scholar selection will be based upon high school performance, standardized tests (SAT), an essay by the applicants indicating their reasons for seeking a career as a veterinarian and two letters of reference. Selection of the scholars will be made by the Selection Committee consisting of the UNC Pembroke Biology Department program advisors, the Director for Diversity at the NC State CVM, and one additional faculty member from NC State-CVM as appointed by the Dean of the CVM. CVM UNC-SVEA Scholars can only be selected by the mutual consent of both universities. In addition to selecting the Scholars, this Committee will annually review all Scholars for continued participation in the program. This review will include evaluation of completed coursework relative to the minimum academic standards for admission to the NC State-CVM and extracurricular activities related to veterinary medicine. Scholars must provide clear evidence of continued interest in veterinary medicine as a career choice and progress towards their degree.